Prime Minister, the Most Hon. Andrew Holness, has announced that a new Economic Programme Oversight Committee (EPOC) has been formed to oversee the implementation of the Government’s new standby arrangement with the International Monetary Fund (IMF). The announcement was made during a press briefing held at Jamaica House, today (November 21). Mr. Holness said EPOC will monitor fiscal, monetary and quantitative targets as set out in the Memorandum of Economic and Financial policies, agreed with the IMF. The renewed EPOC will be chaired by Group Chief Executive Officer of Jamaica Money Market Brokers, Keith Duncan, and co-chaired by Governor of the Bank of Jamaica, Brian Wynter. “We expect the forthrightness of your oversight as was the case before. It is very important that the Government be kept on its toes. There is no room for error on the IMF programme, and we do place a very important role in ensuring that the Government and the country’s policies are kept on track,” he said. 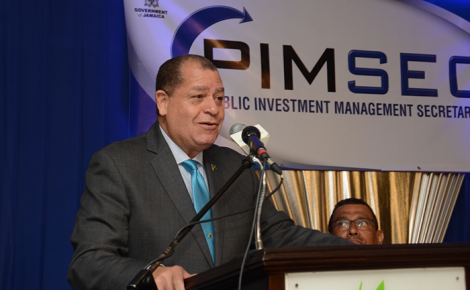 Meanwhile, the Prime Minister revealed the formation of a new committee to oversee the implementation of the Government’s public-sector transformation programme. The Public Sector Transformation Oversight Committee (PSTOC) will be chaired by President of the Hugh Lawson Shearer Trade Union Institute at the University of the West Indies, Danny Roberts. It will be co-chaired by Cabinet Secretary, Ambassador Douglas Saunders. Mr. Holness said PSTOC will monitor the implementation of the public-sector transformation, public-service reform and social-protection targets as set out in the Memorandum of Economic and Financial Policies. He also informed that the committee’s membership will comprise representatives of various special-interest groups. “The PSTOC membership will include members of the Joint Confederation of Trade Unions, the Jamaica Employers’ Federation, the public- and private-sector academia, and civil society. The PSTOC will report to the public the progress in achieving public-sector transformation and social-protection objectives in the IMF programme,” Mr. Holness said. He added that PSTOC will ensure that public-sector modernisation occurs within a framework of public accountability, transparency and openness, with a commitment to equity and fairness.